GRAFENWOEHR, Germany — It’s no secret that disasters, both natural and man-made, seem to be occurring frequently around the world. April is America’s PrepareAthon! month and the perfect time for USAG Bavaria families to get ready for whatever may come, including thunderstorms. Make a plan. This may be the single most important thing you can do, and it’s free. Make sure everyone in your family understands where to go and what to do in case of an emergency. Update your contact information and post it in visible places in your home and workplace. And don’t forget to update DEERS! For help, use the free Ready Army emergency plan worksheets, also available at www.ready.gov. Set aside emergency supplies. Don’t wait for a storm. Buy preparedness items throughout the year instead of all at once. Shop at sales and the Thrift Shop. Choose the essentials that fit your needs and budget. If you don’t have emergency supplies, April is a good time to get started. Download the emergency supply list. Request a gift. We all get things we don’t need. Suggest preparedness supplies as gifts from friends and family. Store water. You don’t have to buy expensive bottled water. Just make sure your water containers are disinfected and airtight. Have at least a three-day supply of water on hand – that’s one gallon per person per day. Pets need about 1 ounce of water per pound of body weight. For a 65 pound dog you’d need around one-half gallon of water- per day. Check your policy. Take a few minutes to review your insurance policy during America’s PrepareAthon! Month. Get with your agent to make any necessary changes. When a disaster strikes, you want to be sure that your coverage will get you back on your feet. 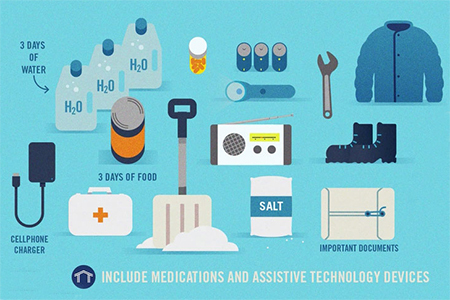 Encourage your loved ones to get ready for emergencies during America’s PrepareAthon! Month. America’s PrepareAthon! is a grassroots campaign for action to increase community preparedness and resilience. Join others around the country to practice your preparedness!